This industry consists of general contractors primarily engaged in the construction of residential buildings other than single family homes. This type of construction includes new work, additions, alterations, remodeling, and repair of such establishments as apartment buildings, dormitories, and hotels and motels. Multifamily residential construction enjoyed strong sales and a promising market for new projects in the late 1990s as the U.S. economy maintained its voracious expansion. And even when the economy began to falter at the turn of the twenty-first century, multifamily residential construction continued to do well, despite the increase in home ownership spurred by low interest rates. Demand for multifamily housing was expected to increase by 1 percent annually until 2010. After apartment construction had outpaced demand through the early and mid-1990s, resulting in increased vacancy rates, contractors were forced to scale back new starts and derive greater shares of revenue from remodeling and repairs, a market that was expected to maintain its strong growth for years to come. By the end of the decade, however, demand had resurfaced, leading to a resurgence of new building activity. This activity continued into the early 2000s. New apartment starts in 2003 increased by 2.8 percent to 316,000 units, although this paled in comparison to the record 1.49 million single-family housing starts, which reflected 10.3 percent growth that year. Hotel construction, meanwhile, remained a notoriously volatile sector. In the early 1990s, construction spending had reeled from a recession, dropping 35 percent in 1991 and another 47 percent in 1992. By 1995 the sector had dusted itself off and regained its healthy position in the construction industry, reaching $6.4 billion. Total spending for hotel construction reached $17.0 billion in 1999, up from $14.9 billion in 1998, and was particularly strong in the luxury hotel market. Analysts familiar with gluts in this market sector, however, had expected that hotel building would cool, as did the U.S. economic expansion, and they proved correct. Along with the impact of the economic slowdown, the terrorist attacks of September 11 drastically reduced U.S. travel, and by 2003, hotel construction had reached its lowest point in industry history, a full 53 percent below its record high in the late 1990s. According to a PricewaterhouseCoopers report, hotel occupancy rates will increase from 59.1 percent in 2002 to 61.6 percent in 2005 as the U.S. economy recovers. 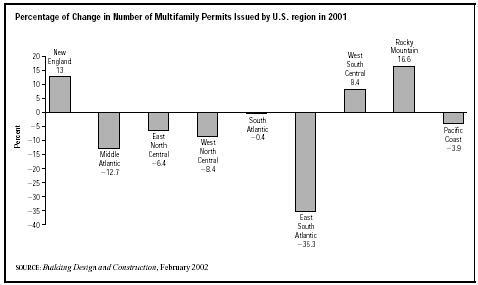 Leading multifamily construction markets in 2004 were located mostly in the South or West: Dallas, Texas; Orlando, Florida; Houston, Texas; Atlanta, Georgia; and Seattle, Washington. Hotel construction, meanwhile, has been strongest in the Pacific and mid-Atlantic regions, while trailing off in the south, central, and mountain regions. The states with the greatest concentration of multifamily construction companies include New York, California, Florida, and Texas. Of the 295,429 multifamily permits issued in 2001, the south Atlantic region of the United States accounted for 92,200 of them, while the Pacific Coast accounted for 44,287. The Rocky Mountain states saw a 16.6 percent growth in the number of permits issued, which grew to 37,912. The New England states experienced 13 percent growth, reaching 4,948 permits. The rising costs of land, labor, and materials were among the primary challenges to multifamily contractors at the onset of the 2000s. Drywall and lumber prices were particularly alarming, while increases in land costs have been less pronounced, though some strong markets, especially in southern cities, have experienced significant escalation. General contractors are licensed professionals who agree to arrange a project in agreement with certain plans, specifications, and other related documents. A written contract usually documents the specific terms. The responsibility of a general contractor extends to every aspect of construction, except those items so designated within the contract documents. General contractors are frequently referred to as builders; however, a developer or owner is also commonly referred to as a builder. Therefore, for purposes of understanding, a general contractor is one who contracts with owners to construct the owners' projects. Multi-unit housing consists of two or more unit structures and includes apartment buildings, dormitories, condominiums, and some townhouses. Apartments constitute approximately 90 percent of all multi-unit construction. Multi-unit construction experienced unexpectedly strong sales in the late 1990s relative to single-family detached homes, despite a strong economy that would normally favor single-family home purchases. The weaker economy of the early 2000s also helped bolster multi-unit construction, despite record low interest rates, which would also normally favor single-family home purchases. This trend toward multi-unit living was due at least in part to the aging of the U.S. population, as retirees typically opt to downsize into multi-unit residences. This industry also includes companies that provide maintenance and repairs, as well as new construction improvements to existing buildings. In general, improvement refers to additions and alterations involving major interior and exterior changes to existing residential structures, and the replacement of major individual items such as furnaces and water heaters. as improved technology, materials, and building processes eliminated much of the negative public perception formerly associated with pre-fabricated housing. A knowledge of the legal aspect of the construction business is a critical component in understanding this complex industry. Construction contractors operate under a significant amount of federal, state, and local regulation, and thus often utilize members of the legal profession. The attorney a contractor selects must be experienced and have complete knowledge of contract law with particular reference to laws that affect contracts between general contractors, owners, and subcontractors. In fact, due to the complex and diversified components inherent in the general contracting business, one attorney often cannot handle all legal requirements of a general contractor. The various arenas of law that impact general contractors that may require legal representation include negotiations, preparing and reviewing contracts, labor law, lien laws, bankruptcy laws, litigation, corporate structure, and general counsel. The extent of the contractor's general business operations and the legal issues regarding individual projects should be the determining factors when a contractor elects to use more than one legal firm or attorney. Attorney services are needed for almost every step of the construction process. Therefore, the choice of a competent general contracting attorney is often one of the most crucial decisions a general contractor can make. Another aspect of the legal portion of general contracting is the vast array of government laws. These laws include both local and area laws. Examples of such laws include laws relating to the inspection and approval of works, the acceptance of plans, the use of certain materials, the conditions under which labor may be employed, and health and safety regulations. Moreover, equipment that comes on site has to be certified safe for use under the conditions of use. Many large contractors have organized their own legal department, usually employing lawyers that are experts in construction law. These legal departments will often perform many of the functions described above that are necessary for a general contractor to operate their business. Demographic and lifestyle trends favored the multifamily residential construction industry in the late 1990s and early 2000s. Despite rising income levels among the prime home-buying age group (25 to 45), more people than ever opted to live in apartments; in fact, the fastest-growing financial-demographic group for apartments was made up of individuals who earn more than $50,000 per year. This shift is attributed mostly to lifestyle changes among younger people entering the housing market, who tended to prefer living in proximity to entertainment venues and shopping. Moreover, the faster pace of living among young professionals helped spark a preference to avoid the continuous upkeep associated with detached homes. To accommodate these developments, multi-family housing facilities increasingly feature such amenities as swimming pools, fitness centers, and gardens. Apartment starts totaled 333,000 units in 2001, compared to 261,000 units in 1998. Older customers also wielded tremendous influence on construction activity, as assisted-living housing facilities exploded in the late 1990s. In 1998, construction reached 32,600 units, up 46 percent from 1997; an additional 31,300 units were produced in 1999. However, most analysts expected that the boom was at an end by 2000. Prices per unit skyrocketed as well, from a median of $39,755 in 1993 to $86,667 in 1995. However, by 2002, the median price had fallen to $65,000 due to a glut of units on the market. Most of the units sold in 2002 (60 percent) had been constructed during the development frenzy of the late 1990s. However, analysts believe the market will recover and eventually flourish as roughly 20 percent of the U.S. population will be in the 65 and older age bracket by 2030. Another market fueling multifamily residential housing construction was low-income housing, spurred by tax-exempt municipal bonds and housing tax credits, which finance multifamily building. Private-activity multifamily housing bond issues skyrocketed from $322.0 million in 1992 to $2.3 billion in 1998. This trend continued into the early 2000s as bond issues grew further to $5.6 billion in 2002. Meanwhile, helping to hedge against some of the more dramatic market swings, particularly those relating to land costs and occupancy rates, was the growing popularity of real estate investment trusts (REITs). While contractors in this industry tend to be rather small with limited market reach, a few firms stood out as clear market leaders. A.G. Spanos Construction of California, one of the largest apartment builders with nearly 12,000 in annual starts, boosted its revenues 21.4 percent to $1.7 billion in 2003, while maintaining a payroll of 600 employees. JPI of Irving, Texas, achieved revenues of roughly $500 million in early 2000s. Trammell Crow Residential of Atlanta, Georgia, garnered $692.1 million from residential starts in 2003, and employed 6,300 workers. Colson & Colson Construction of Salem, Oregon, brought in revenues of $900 million in 2002 and employed a total of 7,300 individuals. The construction industry has always been labor intensive. This fact has not cheered contractors in the late 1990s and early 2000s as an extremely tight labor market has led to wage pressures, causing many industry players to fear further inflation of construction prices. Some analysts suggest that the shortage of skilled labor was the most serious problem facing the industry at the start of the twenty-first century. The Bureau of Labor Statistics named construction as one of the most promising industries for job seekers in the early 2000s. Construction workers in 2002 earned an average of $18.51 per hour. Craftsmen generally acquire skills during an apprenticeship, usually over a period of four years. "2003 Apartment Starts Increased 2.8 Percent, but Economist Predicts Starts Will Not Increase Substantially This Year." Multi-Housing News, 24 February 2004. Available from http://www.multi-housingnews.com . "Building Construction Academy to Address Nationwide Labor Shortage." ENR, 6 January 2000. Duff, Susanna. "IDB Falls; Housing Booms." The Bond Buyer, 2 June 2003. "Multifamily Fares Well in Weak Economy." Building Design and Construction, February 2002. "Survey: Prices for Assisted Living Units Decline." Health Care Strategic Management, April 2003.